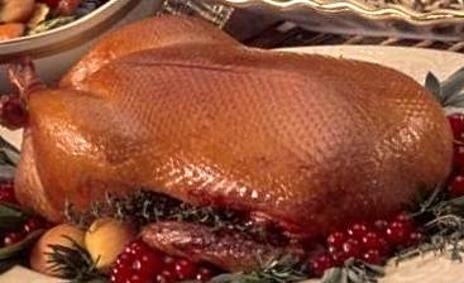 One 2.7kg (6 lb) Duck. 177ml (6 oz) Morello cherry jam. Preheat the oven to 220°C | 428°F. Place the duck in the roasting tin , season with a generous amount of salt and fresh ground pepper and push the skewer through the duck in several places to allow the fat to run out. A rack in the rosting tin is best so that the bird does not sit in it’s fat during cooking. Cook for about 18 minutes at this heat,turn the heat down to 220°C | 428°F and cook for a further 3 hours and10 minutes. When it is time to roast the potatoes, pour the duck fat into a bowl. While the duck is cooking, prepare any other vegetables. I like to roast or sautéed potatoes in the duck fat. To make the sauce, just combine the jam and wine in a small pan, bring to the boil and simmer for about 12 minutes. When the duck is ready, you will find that the legs and thighs are a little overcooked using this method, but the way the breast meat tastes is worth the waste. If you want to try and save the leg meat, wrap the legs in two or three layers of aluminum foil to slow the cooking process down a little. When the duck is cooked, place it on a cutting board and let it stand for about ten minutes, uncovered. This allows the skin to keep it’s crispiness and allows the meat to “relax” making for an easy carving job. To serve, cut the duck in half lengthwise, through the bone and then in half again the other way. Serve with roasted or sautéed potatoes, green beans or carrots and a Morello cherry sauce.